Nearly 10,000 people stop by Aledo, Ill., for the town’s annual rhubarb festival, where nearly 4,000 rhubarb pies were sold last year. 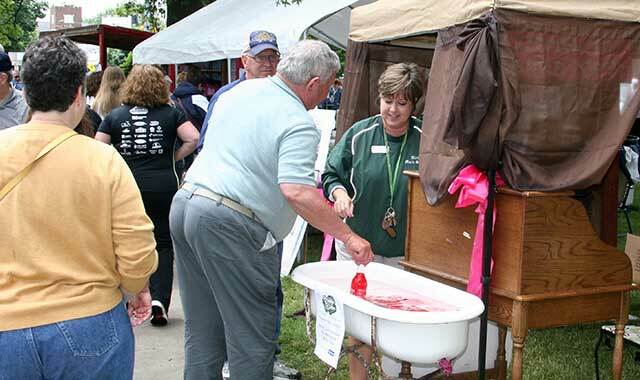 Whether or not you enjoy rhubarb, you’re sure to enjoy one of our region’s most obscure festivals, which happens this June 5 and 6 in Aledo, near the Quad Cities. The population of this small Illinois community nearly triples during the first full weekend in June, when 10,000 people descend upon its Central Park for the annual Rhubarb Festival. The No. 1 attraction, as you might suspect, is the sampling of some form or another of rhubarb that’s been cooked up by the people of Aledo: rhubarb pie, rhubarb lemonade, rhubarb wine, rhubarb ice cream and more. The possibilities are endless in the city that officially was deemed the “Rhubarb Capital of Illinois” by former Gov. Pat Quinn. Even if you’re not a rhubarb fanatic, the free festival boasts plenty of attractions. On Friday and Saturday, free narrated trolley tours will navigate Aledo, and musical acts will play on the band shell stage. The Central Park Market also will be open both days, with food vendors, bake sales, a flea market and crafters. Saturday morning, the annual 5K Rhubarb Run/Walk and YMCA Little Sprouts 1-mile fun run take place, followed by an all-day Crafts in the Courtyard show that features nearly 150 exhibitors. If, by the end of the weekend, you, too, are a rhubarb fan, stop by the Aledo Main Street booth for some complementary rhubarb seeds. More than 12,000 have been distributed in past years. Now in its 24th year, Aledo’s Rhubarb Festival grew from humble beginnings. Darlene Johnson, who has lived in Aledo since 1944, had just renovated a big stone home and opened a consignment/craft shop with her cousin, Barbara McWhorter. The cousins wanted a fun way to attract customers to their business. Given the pair’s mutual fondness for rhubarb, they decided to drum up visitors by hosting a rhubarb tasting. The cousins eventually invited other organizations to join their event, and by 2000, the festival had moved to Central Park to accommodate thousands of participants and visitors. Today, nearly every organization in town participates, with many hosting their own rhubarb bake sales. In fact, more than 4,000 rhubarb pies were sold last year, Johnson says, in addition to the rhubarb novelties available inside the festival’s tasting tent. For festival information, visit aledomainstreet.com. For more attractions in the Quad Cities area, go to visitquadcities.com. But if you want to head to the original “Taste,” the Taste that precedes all other Tastes – even the Taste of Chicago – you need to head to Glen Ellyn. This suburban community in DuPage County hosted the very first Taste 38 years ago, says Mike Formento, executive director of the Glen Ellyn Chamber of Commerce. And, it hosts the next Taste of Glen Ellyn this year from Thursday, May 14, through Sunday, May 17, right on Main Street. Even now, nearly four decades after whetting its appetite, the Taste of Glen Ellyn is providing new activities for visitors. One new feature will be the format in which the four-day festival’s live musical entertainment is laid out. Each night’s musical entertainment has a different theme. On Caribbean Night, for instance, steel drum bands will perform, while jazz bands will headline jazz night. Country/western night is pretty self-explanatory. Of course, the Taste wouldn’t be the Taste without a huge selection of local food vendors. Many participants are restaurants located within Glen Ellyn and its neighboring villages. “If you haven’t been before, you want to absolutely taste all of the food selections we have, which are representative of many of the restaurants in the community, so you’ll know what they serve, and you may be interested in returning,” Formento says. From a popularity standpoint, the highlight of Saturday and Sunday tends to be the annual craft show. The Taste’s business expo provides a chance to discover many services available in the community, especially from nonprofit organizations. The ongoing carnival at the Village Fair is a great way for families to spend time together. The festivities also include some fun activities, such as the waiters’ race. “All of the waitresses in town race to carry a tray of drinks and see who can travel the course quickly without spilling anything,” says Formento. Plenty of surprises await, but one thing is certain: You have to visit the Taste to really understand what it tastes like. For more information, visit business.glenellynchamber.com. After a cold winter and lots of time spent inside, Rockford is the perfect destination to get moving outdoors. “There’s a great mix in Rockford of urban amenities, but you have all these natural elements as well,” says Josh Albrecht, director of marketing and public affairs at the Rockford Area Convention and Visitors Bureau. One urban amenity is the newly opened West Rock Wake Park, located on Levings Lake, right off the Route 20 bypass. The park allows wakeboarders to ride without a boat, which eliminates the need for a truck, trailer, gas and other expensive items that once were necessities – and hindrances – of wakeboarding, says Dan Jarrett, co-owner of West Rock with his wife, Amy. In this high-tech wakeboarding park, 30-foot cable towers tow multiple riders across the lake at a time. Cable wakeboarding has become popular in Europe and is quickly catching on in the U.S., to the point where it’s being considered for inclusion in the 2020 Olympics, Jarrett says. “It’s very easy for beginners to get up and learn basic maneuvers, and a cable park gives advanced riders endless potential to progress on what appears to be a ‘floating skate park,’ with various features to slide and jump off,” says Jarrett. While Jarrett’s goal is to grow his favorite childhood sport, visitors don’t have to wakeboard to take advantage of West Rock. The park has partnered with the Rockford Park District to offer stand-up paddleboarding, a swim beach, volleyball and basketball courts, and more. West Rock’s first full season begins May 1 and continues through mid-October. To learn more, visit westrockwakepark.com. If extreme sports aren’t your thing, Severson Dells Nature Center, located within the Severson Dells Forest Preserve, is a great way for families to explore the outdoors. The kid-friendly property sits on 369 acres rich in prairies, an oak hickory forest and other habitats, says Don Miller, director of nature education. Newer to the nature center is an outdoor children’s area called The Grove. While not exactly a playground, the 1.5-acre space is filled with play equipment made from natural materials and designed to develop motor skills and other skills in children ages 4 to 11. An art pod, music pod, climbing area, spider web and additional features make up The Grove, which opens for the season May 9. Families are encouraged to take advantage of a special open house that day by engaging in children’s nature literature and related activities, listening to a storyteller, participating in a drum circle or creating an art project. “We’re really hoping it’s going to be a great destination spot for people to come out,” Miller says. Don’t forget the Rockford AirFest on June 6 and 7. The two-day event brings 150,000 spectators to the Chicago Rockford International Airport (RFD) to watch 10 aeronautic military and civilian acts perform. This year’s headliner will be the U.S. Navy Blue Angels, who will be making their first local appearance since 2007. A static display featuring planes – such as the F-86 Sabre, the “oldest flying jet” in the world – will be available for patrons to tour and touch, with pilots on scene to chat about the aircraft. New this year will be an evening Run the Runway 5K race on Friday, June 5, with additional 1-mile and kids’ races available. Proceeds benefit Winnebago CASA and United Way of Rock River Valley. Tickets are $40 per carload at the gate; prepaid tickets are $30. Learn more at rockfordairfest.com. For more Rockford-inspired events, visit gorockford.com. 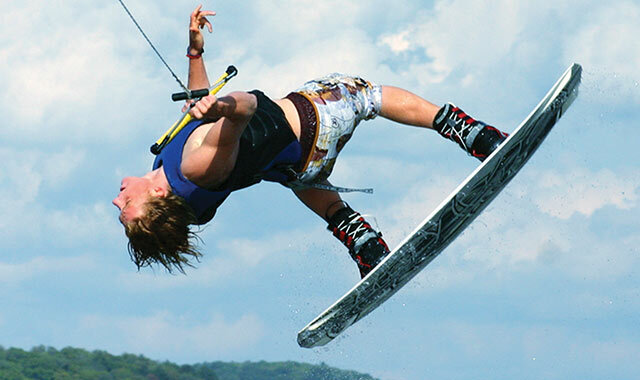 Since 2009, Charlie Copley has been eyeing the Three Oaks Recreation Area in Crystal Lake for a special project: a 32-acre cable wakeboard park. This summer, his dream will become a reality when The Quarry Cable Park and Grille debuts. 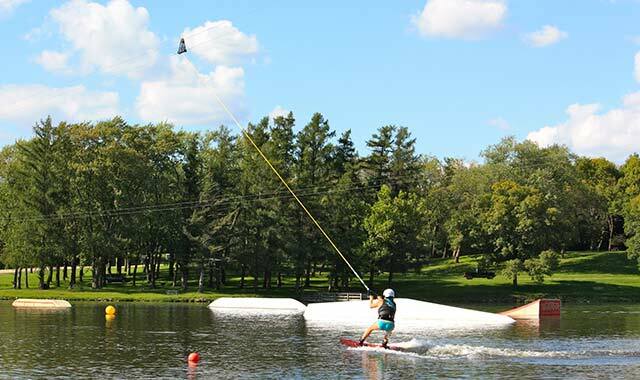 That “cable system” – motorized cables suspended by towers – allows riders to wakeboard without a boat, making the sport much more accessible. Although they’ve been popular in Europe for decades, cable wakeboard parks have just recently caught on in the U.S.
Copley shared his vision with fellow Crystal Lake resident Pat McGinnis, 40, and the two construction business owners won a bid from the city to bring the park to life, complete with jumps and obstacles on the water, plus a bar and grill, volleyball and bags courts, a live music stage and more. McGinnis says the two plan to host special programs for veterans, boys and girls clubs and special-needs groups down the road. For a relaxing summer activity, consider the Woodstock Mozart Festival, a three-weekend classical concert series that pays tribute to Wolfgang Mozart and those influenced by his work. “It’s kind of been the best-kept secret in McHenry County,” says Jack Bechaud, a festival volunteer and marketing assistant. Each Saturday and Sunday from July 25 through Aug. 9, a concert will be presented in one of two locations: the historic Woodstock Opera House or the Sanfilippo Place de la Musique in Barrington Hills. Both will feature Grammy award-winning musicians playing in a smaller hall – a venue preferred by Mozart, Bechaud says. The Sanfilippo Place de la Musique houses the world’s largest collection of antique automatic music instruments, such as music boxes, phonographs and coin-operated pianos. Jasper Sanfilippo – former CEO of John B. Sanfilippo and Son Inc. in Elgin – and his wife, Marian, wanted to share their collection, but they also wanted to benefit nonprofits, says Gregory Leifel, executive director of The Sanfilippo Foundation. So, they opened up their 44,000-square-foot mansion to charity events and fundraisers. 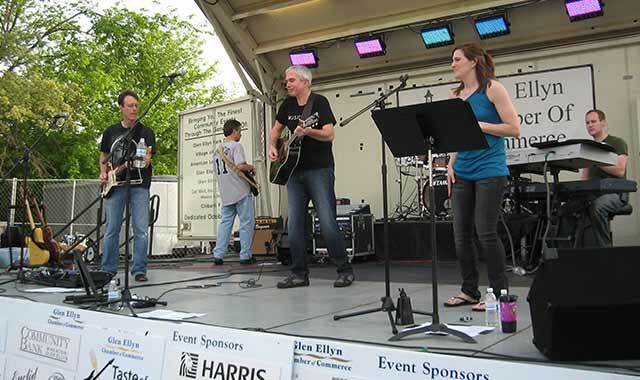 One popular activity is the Sanfilippo Foundation Summer Concert Series, hosted once a month from June through September. The concerts include a 90-minute tour of the house and music machines, followed by a 90-minute concert. Most of the estate is open to visitors, including a 30,000-square-foot Carousel Pavilion that houses an 1881 steam locomotive, train cars and the 1890 Eden Palais Carousel, the most complete European salon carousel in the world. Last year, more than 15,000 people visited the estate, raising more than $1 million for charities, Leifel says. The Sanfilippo Foundation hopes to match that milestone again this year. To learn more, visit sanfilippofoundation.org. Discover more McHenry County attractions at visitmchenrycounty.com. Four years ago, a small group of Dubuque film critics received 20 submissions for a new attraction: a film festival meant to pay homage to independent filmmakers. This year, 400 films were submitted to the Julien Dubuque International Film Festival (JDIFF), which quickly has grown into an internationally recognized event with $35,000 in cash prizes being dispersed among top filmmakers. From April 23 through 26, the entire Main Street area of downtown Dubuque will bustle with film screenings and special events. For the past several months, nearly 90 Dubuque-area residents have viewed and rated 400 submitted films from around the world, Wright says. The committee’s top 35 choices will be screened during the festival, while the final winners – selected by a panel of editors, directors and other industry experts from Los Angeles and New York – will be revealed at an awards ceremony and gala Saturday evening. The Grand Jury winner will take home $15,000. 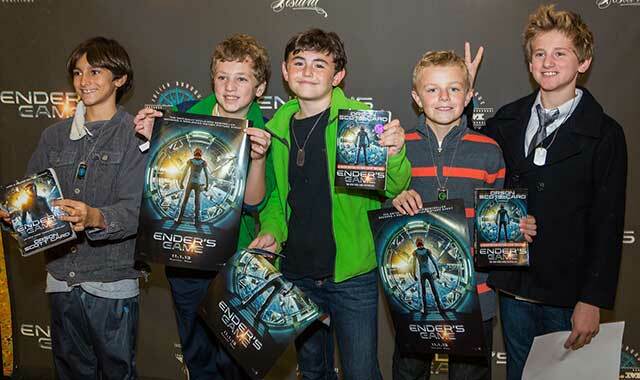 Film festivals in general are appreciated because they offer a first look at many unusual films. What makes the JDIFF even more valuable, however, is the opportunity viewers have to interact with directors. Ticketed screenings will be staggered at venues such as cafes, bars, the Holiday Inn and the Hotel Julien, which acts as a central hub for the festival. Among additional special events, the Dubuque Symphony Orchestra will play a live score to Harold Lloyd’s silent film, The Kid Brother, on Friday evening at the Five Flags Theater. But simply walking around town can be an adventure, Wright says. Actors are known to attend the festival, such as Broadway actress Kate Mulgrew, a Dubuque native who portrayed Capt. Kathryn Janeway on Star Trek: Voyager and Red on Orange Is the New Black. For ticket information and more, visit julienfilmfest.com. For additional Dubuque-area events, visit traveldubuque.com. This entry was posted on Monday, May 11th, 2015 at 11:57 am	and is filed under Recreation & Destinations. You can follow any responses to this entry through the RSS 2.0 feed. Both comments and pings are currently closed.